Harry F. Olson is most likely an unfamiliar name, but I’m sure you’ve heard of one of the 100 plus inventions Olson has patented. His patents include the cardioid microphone, sound absorbers, and the first programmable music synthesizer. He was directly responsible for the RCA 44 and RCA 77 ribbon microphones. In the early twentieth century, there was a surge in innovation and technology, and Harry was at the forefront exemplifying the ingenious spirit that embodied the people of the time. Olson spent 40 years working with RCA, where he was in charge of their acoustic research department and many of the great inventions that came out of it. You can’t mention ribbon microphones without mentioning RCA, and you shouldn’t mention RCA without mentioning Harry Olson. Ribbon microphones were the last of the four main microphone designs invented. 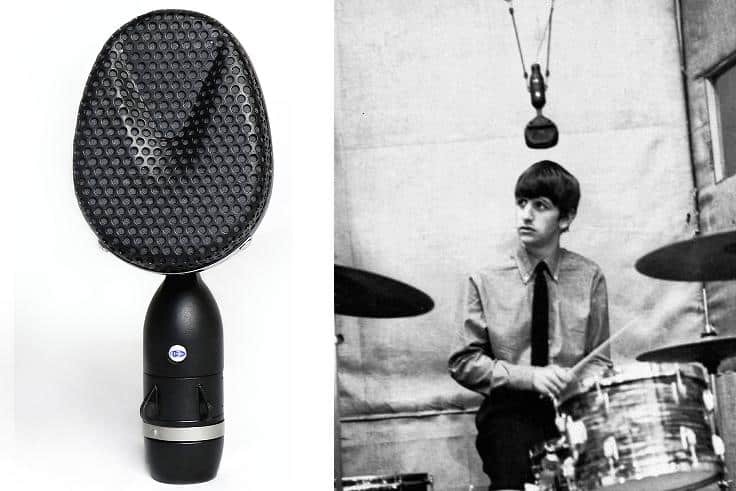 These microphones quickly grew in popularity and eventually into legendary status for their smooth, warm, and natural sound. RCA used their resources to provide an extensive research and development effort that was unrivaled by any other company at that time. For over 40 years Harry Olson worked for RCA innovating and developing new products, mainly for their acoustical research department. Born in Mount Pleasant, Iowa in 1901, Harry was technically inclined from an early age and showed a strong interest in science and technology. His parents catered to his scientific spirit and built him his own laboratory; he spent time there making things like a steam engine and wood fired boiler. After graduating at the top of his class from the University of Iowa’s College of Engineering, he received a scholarship to attend graduate school and earned his Master’s Degree in acoustics. After graduate school, Harry moved to New Jersey and joined RCA’s Research Department, and it was there that he worked on the wide range of products for which he became most famous. During World War II, just about all American companies switched their focus to military technology, and RCA was no different. 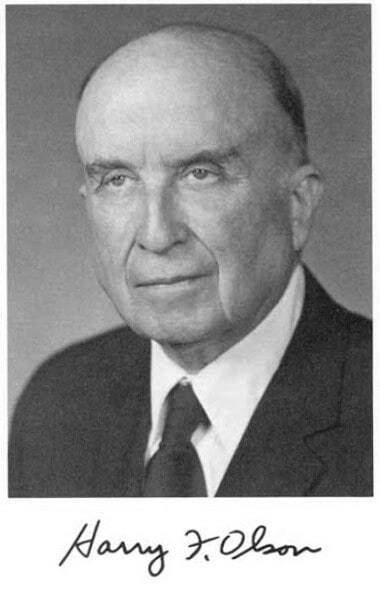 Olson led a group that worked on military projects with a strong emphasis on underwater sound and antisubmarine warfare. This work included improving sonar transducers and voice communication transducers that could be used in noisy environments. When the war ended, Olson went back to working on his research in sound reproduction. He famously conducted an experiment that would determine the preferred bandwidth for reproduced music. Before this experiment, studies had shown that listeners preferred a high frequency cutoff of 5 kHz. Olson didn’t believe this to be true. He was sure that if the sound was free of the imperfections that were common of the time, such as added noise, hiss, harmonic distortion, then the listeners would prefer full frequency sound reproduction. To test his hypothesis, he set up an orchestra with the listeners positioned in a way that a physical acoustic screen with a low pass filter could be open or closed. This experiment proved his theories to be correct– the majority of the audience vastly preferred full frequency reproduction. It was because of this experiment that high fidelity sound equipment gained increased popularity. This ultimately impacted everything from record players to amplifiers, speakers and tape recorders. The first commercially produced ribbon microphone (also known as a velocity microphone) was released in the early 1930s. A ribbon mic works like a dynamic mic except instead of using a moving coil as the transducer, it uses a ribbon. The ribbon picks up sound much like the way your ears do naturally. This is because ribbons are designed similarly to the way your ears pick up sound. Most ribbon microphones are open on both sides, which naturally gives them a figure-8 polar pattern. Interestingly, this made them very popular with the film industry as they could place the camera in the null area of the microphone and minimize the amount of camera noise bleeding through. Without a doubt, the two most famous ribbon microphones are the RCA 44 and 77. Both invented and patented by Harry Olson. The 77 microphone was the very first ribbon microphone designed and introduced by RCA. It was rumored to have been in development as early as 1929 but wasn’t officially announced until 1932. 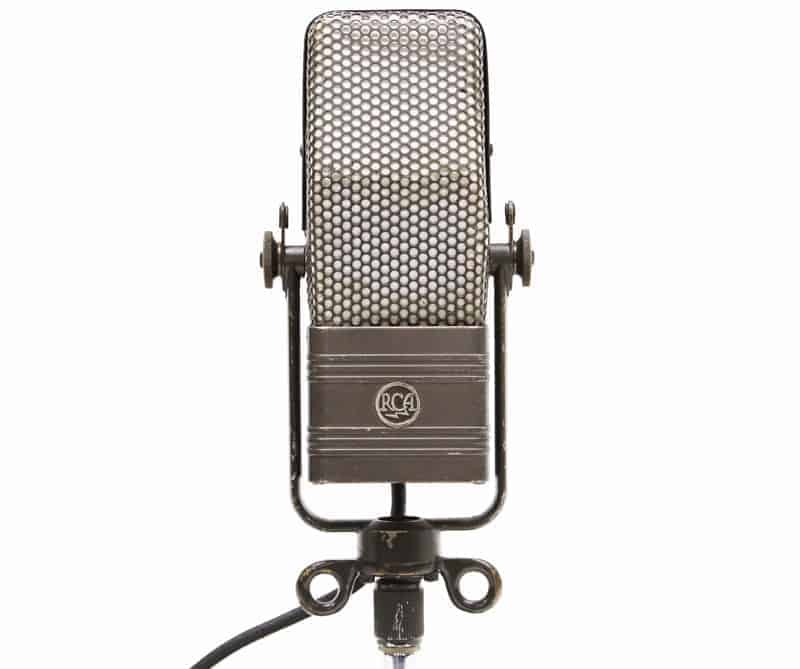 The first 77 model was the rarest of all RCA microphones and featured two ribbons and an “acoustic labyrinth” which allowed it to be uni-directional. The 44A was a smaller and lower priced version of the 77A. The lower price point was a significant contributing factor to this microphone’s success and popularity. This is the microphone you think of when you picture Elvis or Frank Sinatra or an old radio broadcaster. The look of the microphone might even be more legendary than the actual performance. The 44B/BX were both a slightly larger version of the 44A. The BX has the ribbon mounted further towards the back giving it a smaller figure 8 pickup pattern on the rear side. The BBC noticed the 44 being used in American broadcasting and wanted one for themselves. The only problem was it would cost them £130 ($8500 in 2017). This was way out of the BBC’s budget, so they decided to make their own ribbon microphone. F W Alexander who worked in the BBC research department invented the Type A whose successor the 4038 is still being made by Coles Electroacoustics. The RCA 44 was discontinued in 1957, yet they are still seen in studios all across the world and are still going for thousands of dollars on eBay and Reverb.com. Harry Olson’s impressive legacy has left us with these indispensable tools that have dramatically and significantly impacted the history of audio.